It is not too far-fetched to say that if you do not have professional training in all things garage doors, chances are you are going to be shocked if and when something goes south. But one you may not know is that before things got really bad, there were noticeable signs, you just didn’t pay close attention or decided to ignore them altogether. It is important as a homeowner to be able to observe and identify these signs and take proper actions to prevent serious damage and unnecessary expenses. Garages doors are quite useful, so useful in fact it is almost impossible to imagine your home without it: they help protect your car from the elements and thieves and serve a protective function for your home itself. They do a lot of work going up and coming down at your command, and like every machine they breakdown but never suddenly, there’s always a sign or two that are indicative of a bigger problem. So it is imperative that you get acquainted with these signs to help stave off something worse. Sometimes, you may have noticed that there was delayed response when you the button for the door to open or close. Other times is just didn’t respond at all, it just stood there staring you in the face. This is indicative an underlying problem and you should have it checked out as soon as possible. You can do the simple things first, like replacing the remote batteries or realigning the sensors. If none of these steps yield any positive result, you should call a professional. You don’t want to be stranded by a faulty door now, do you? I thought so. Slow-motion – Good for Movies, not Your Door! Yes, this one can be very annoying: when you hit the button and the garage door takes forever to go up or come down. This can’t be very pleasant. Slow moving doors are usually a sign of a weakened torsion or extension spring. You’d need to get an expert to fix the problem as soon as possible to save you those precious minutes of waiting for it to work, not to mention avoiding an unexpected broken spring. Sadly, you can’t push a button and your garage door switches to silent mode and goes dead silent as it operates. 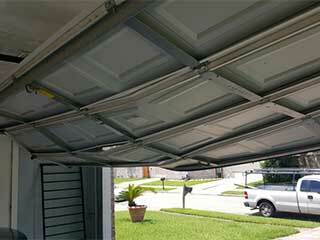 Garage doors, as with almost every machine on the planet, make some level of sound as they work. Even belt driven doors still give off sound, though not as much as the chain driven types. However, when your garage door begins to make screeching, squeaking, shrieking, and rattling noises, loud enough to wake the dead, and your neighbors, that’s a sure sign that it needs to be checked out by a professional. It could mean a few moving parts need lubrication, but it could also be indicative of severe rust in the rollers. In any case, contact an expert to have it checked out.